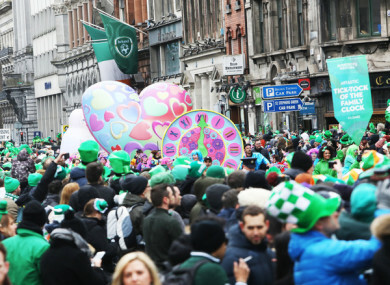 St Patrick's Day in Dublin last year. IT’S THAT TIME of year again – when government ministers jet off to the far corners of the world to spread Irish cheer and everyone wears green. And while certain events concerning our nearest neighbour (*AHEM* Brexit) are overshadowing things a bit this week, come Sunday countries across the world will be channeling their inner Irish. Last year, we had snow on 17 March, and this year it’s looking like it will be cold across the country with some wintry showers forecast – but will that keep you at home? Whether you’re in Dublin, Cork, New York, or wherever else green is worn, will you be going out to watch the festivities or sitting at home and paying the whole thing no mind? Today we’re asking, Will you attend a St Patrick’s Day parade this year? Email “Poll: Will you attend a St Patrick's Day parade this year?”. Feedback on “Poll: Will you attend a St Patrick's Day parade this year?”.